Baked salmon is the quintessential British summer dish. It is a beautiful sight – grand and celebratory – but it is often overcooked so you need to approach it with care. I have suggested butter here as the fat to use, but this is only if you are serving the dish warm. To serve cold, use olive oil instead (butter will congeal). Cut the ends from the cucumber and slice the rest into almost transparent slices. Layer in a colander with the salt, place a plate on top and set over a bowl. Leave for 2 hours. Rinse the cucumber and pat dry. Mix with the remaining ingredients and keep covered, in the refrigerator. Preheat the oven to 220°C/425°F/gas mark 7. Wash the salmon inside and out and pat dry. (Wash bloody bits well; they make the salmon bitter.) If you’ve taken it straight from the refrigerator, leave for about 30 minutes so the chill goes off it. Melt the butter. 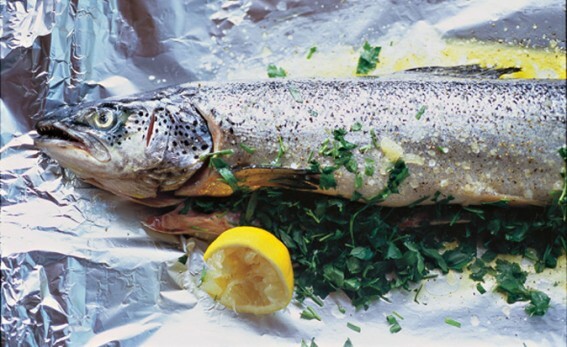 Put a large sheet of foil – big enough to enclose the salmon with room to spare – on a baking sheet or in a large roasting tin. Brush with some butter. Season the fish inside and out and put it on the buttered foil. Put the herbs inside, then drizzle the butter over and inside. Pour on the wine and lemon juice. Tent the salmon with the foil (it needs room to steam). Scrunch the edges together to make it airtight. Bake for 45 minutes. It should be ready, but to check rub the skin with the tip of a blunt knife: if it slips off easily, the salmon is done. Remove the salmon from the parcel, being careful not to lose the juices. If you’re serving the fish hot, drain the juices into a pan and reheat them slightly, then pour into a warmed sauce boat. Serve the salmon whole on a platter, or remove the skin and lift pieces on to individual plates. Serve the cucumber alongside. To serve it cold, leave the salmon to cool in the foil parcel and remove the skin before serving.